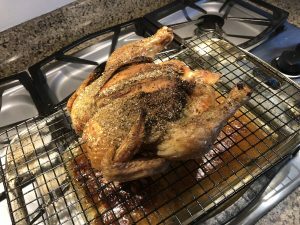 Roasted Chicken Recipe- OF GREATNESS | Awkward; Yet Healthy. Ok, so I love a good roasted chicken! But something about buying a whole chicken, prepping it, and getting it all correct just seemed overwhelming to me for a long time. NOT ANYMORE! 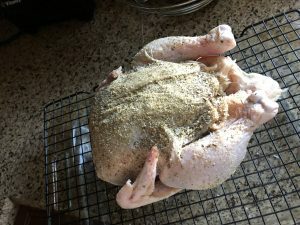 Today I am going to tell you how to roast a chicken and have it turn out AMAZING with stuff you already have at home. Because dinner doesn’t need to be complicated. This can either be made in the oven OR the crockpot. BOOM. Unwrap, rinse, and ‘clean out’ the chicken. Sometimes the innard will be in a baggy inside the bird. I just toss those. We’re not fancy here. I dab the chicken dry with a paper towel and place on a cooling rack topped backing dish breast up. I like this space between the roasted chicken and bottom of the pan, but it’s not necessary. Peel back the skin on the breasts and close to the drumsticks. place the dry rub under the skin over as much of the chicken as you can reach. Replace the skin back on top of the breasts and pour any remaining seasoning on top. Then coat very lightly with olive oil. Place the chicken in the oven for 2-3 hours until done. It’s that simple! I also like to turn the oven down to about 180* and let the chicken sit if I need more time to finish dinner or I put it in early when I got a chance. Literally, do the exact same this as above, but don’t bother preheating the oven, that’d be silly. 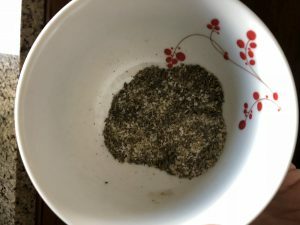 Instead, put the seasoned chicken into the crockpot (preferably lifted from the bottom by an insert) and cook on low for 5-6 hours, or high for 3-4 hours. A crockpot chicken will fall apart MUCH easier than an oven roasted chicken, so be prepared. Roasted chicken is such a staple. It is a different texture, taste, and experience than plain chicken breast, so I encourage everyone to add it to their meal plan. It goes with ANYTHING. And you get leftovers for chicken salad. And a carcass for bone broth. You can’t go wrong!